Canon has said that even though compact camera sales are experiencing a general downturn, people are investing more in individual cameras purchased. According to industry analysis, 2011 saw a 30% drop in the number of compact cameras sold, with smartphones with ever better cameras being pinpointed as the cause. However, Canon, which though probably best known for its DSLRs, also manufacturers a wide range of compact cameras says these figures aren't worrying. Canon UK's David Parry told TechRadar, "People are looking for different things in cameras now, a different design, a different look. "They're looking for big zoom lenses in small cameras, that's what we're seeing and that's what people are asking for - they want big specifications, but they want them in tiny bodies." We've seen a speight of compact cameras recently announced with huge optical zoom ranges. Where once the megapixel was king, now it seems marketeers have a new high number to push. 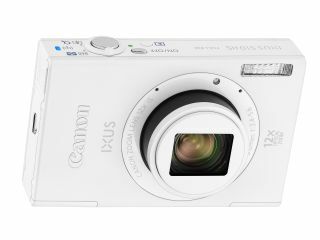 Canon's own IXUS 510 slots into its "stylish" range of cameras, but still manages to pack an impressive 12x zoom into its slim body. Parry believes it is cheaper compacts that are really suffering. "What we're seeing is that people are investing more in digital compact cameras, the quantities might be going down, but the quality of what people are buying, the higher end cameras, isn't." "At the moment smartphones aren't the answer to a good quality compact camera. They don't have the low light capability, they just can't capture the motion and they don't have the added features that you get from a quality compact." "Canon plays in the higher end of the market, and we're still producing what we think are market leading cameras. There is nothing else like an IXUS camera out there, and that's where we're seeing the growth and the interest in the market."